Two diamond audio d612 subwoofers in a fiberglass ported box. Also a diamond audio d6 1000.2 amp. These subs hit hard for the money. 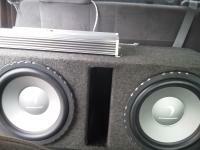 $150 per sub, $500 for amp, $75 for box. Or whole package for $800. Text 419-577-4797 for more pictures and info.